A. T. Greenblatt is a mechanical engineer by day and a writer by night. She lives in Philadelphia and is known to frequently subject her friends to various cooking and home brewing experiments. She is a graduate of Viable Paradise XVI and Clarion West 2017. Her work is forthcoming or has appeared in Disabled People Destroy Science Fiction, Beneath Ceaseless Skies, Clarkesworld, and Fireside, as well as other fine places. 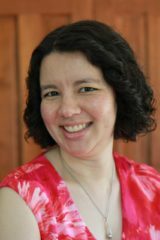 Her story “And Yet” is nominated for the 2018 Nebula Award and was originally published in Uncanny Magazine exactly one year ago. You can find her online at atgreenblatt.com and on Twitter at @AtGreenblatt. Her moving tale about a new relationship in a post-apocalyptic world—“Before the World Crumbles Away”—is Greenblatt’s third story to appear in Uncanny. Uncanny Magazine: One focal point of “Before the World Crumbles Away” is the evolving relationship between Elodie and Marina. I loved their contrasting perspectives and the way their dynamic changes as the story progresses. Was their relationship a starting point for the story? A. T. Greenblatt: Yes! This was one of the stories I wrote during Clarion West. Each week during the workshop, I gave myself the challenge of writing something that was outside of my comfort zone. My goal for this particular story was to write an emotional relationship between two characters and to use alternating points of view to tell it. I wasn’t sure if I could successfully write a romantic relationship, having never written one before, and the story was learning experience for me. It took a bunch of revisions to get right. 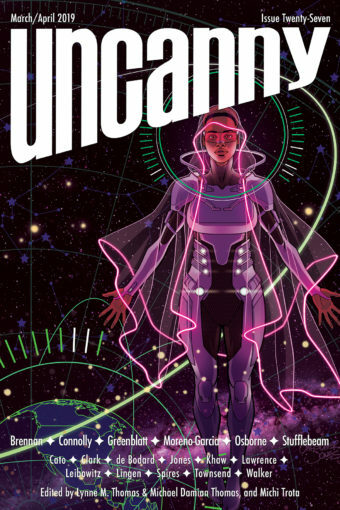 Uncanny Magazine: “Before the World Crumbles Away” features technology (Marina’s eyes and Elodie’s android) that has drawbacks and limitations. Does your engineering background influence how you portray technology in your fiction? A. T. Greenblatt: Engineering definitely influences my writing. For a long time I had difficulty writing science fiction because I had trouble building worlds where the tech worked plausibly. From my years in design work, I’ve come to realize two things. First, no piece of technology will be a perfect solution, no matter how well it’s designed. Second, the end users will always end up using the technology in ways that the designers never imagined. And that’s where the good stories are. In this story, I really wanted to show technology advances, especially Marina’s eyes, that are a workable solution, but not a perfect one. I don’t believe in “magic bullet” fixes, especially when it comes to aiding the human body, only varying degrees of success. Uncanny Magazine: As the world is falling apart, some people turned to games—Elodie is programming her android to play board games, and her roommate escapes into video games. How did you choose which games to include? And are you a gamer? A. T. Greenblatt: All the board games I included in this story are ones I used to play with my younger sisters. I loved checkers and they insisted on playing Candy Land because they had a good shot at winning. I am a gamer and have gotten lost in Final Fantasy games before (X, XII, XII, and XV). Video games are sometimes my burnout recovery method. These days I’m playing Horizon Zero Dawn on the PS4 and usually have to set a timer so I don’t play for hours. Also, a bunch of my coworkers and friends are board game nerds and have introduced me to tons of new and more complicated board games. My current favorite is Dice Forge. Uncanny Magazine: If you were a painter in this story, would you paint the cracks? A. T. Greenblatt: That’s a really interesting question! I think it would depend on my audience, or rather what I’m trying to convey to them. As a general rule, I don’t think we should cover up what’s wrong in the world. But I also think it’s the job of an artist to show a truth, sometimes an upsetting truth, with beautiful lies. Uncanny Magazine: Something I admire across all your stories is your ability to write realistic sympathetic characters. What is your process for coming up with them? Do they ever do anything unexpected, or only what you tell them to? A. T. Greenblatt: I love writing stories focused on one or two characters trying to accomplish or create something in the (sometimes strange) universe they live in. I’m always putting my characters in terrible situations, but I always want them to succeed. So they all begin to grow from that seed of hope. For me, if the characters and I are going to be making this journey together, I really need to empathize with them or I’ll end up abandoning the story halfway through. My characters definitely have minds of their own. One of the most common critiques I get on my first drafts is “I’m not sure why character X did this.” To which I reply, “Neither do I.” My revisions are usually where I learn why my characters do the things they do. It’s sort of like the process of an acquaintance becoming a friend. A. T. Greenblatt: I just finished revising a bunch of stories, so my project list is weirdly short right now. Currently, I’m working on a novelette and writing flash for Codex’s Weekend Warrior contest.